TOKYO (Oct. 12, 2007) â€“ Nissan Motor Co., Ltd will introduce the world’s first Around View Monitor, which offers the driver a bird’s eye view of the vehicle and its surroundings in real-time. 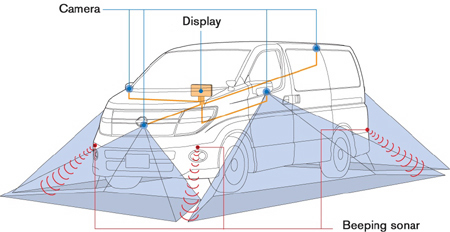 In Japan, the Around View Monitor will debut in the new Elgrand, scheduled for introduction at the end of this month. The technology will also be offered to the U.S. market on the all new Infiniti EX35 scheduled for launch this December.